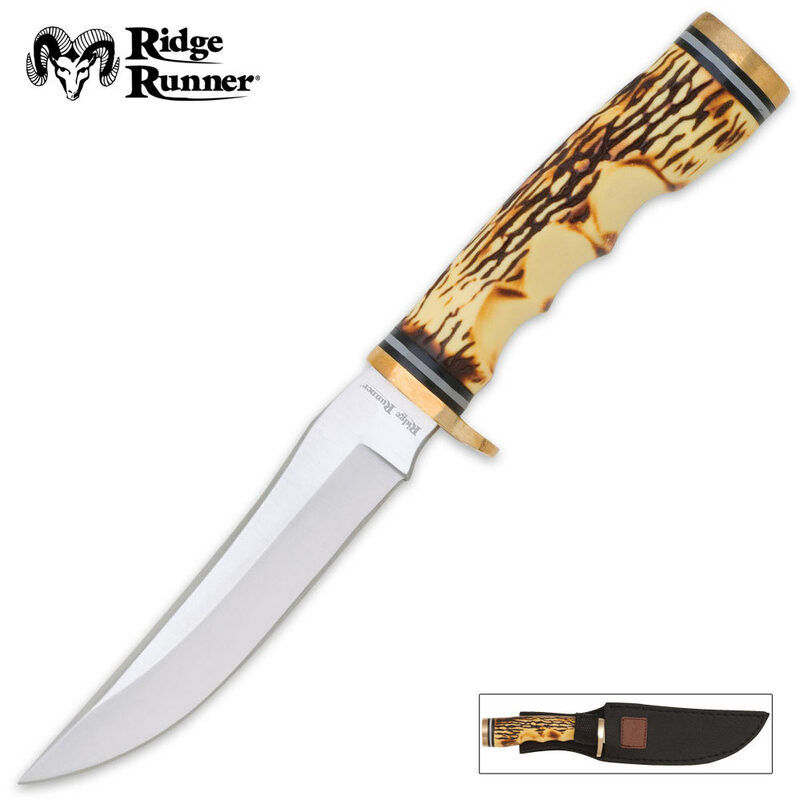 Ridge Runner Large Wichita Skinner Knife with Sheath | BUDK.com - Knives & Swords At The Lowest Prices! 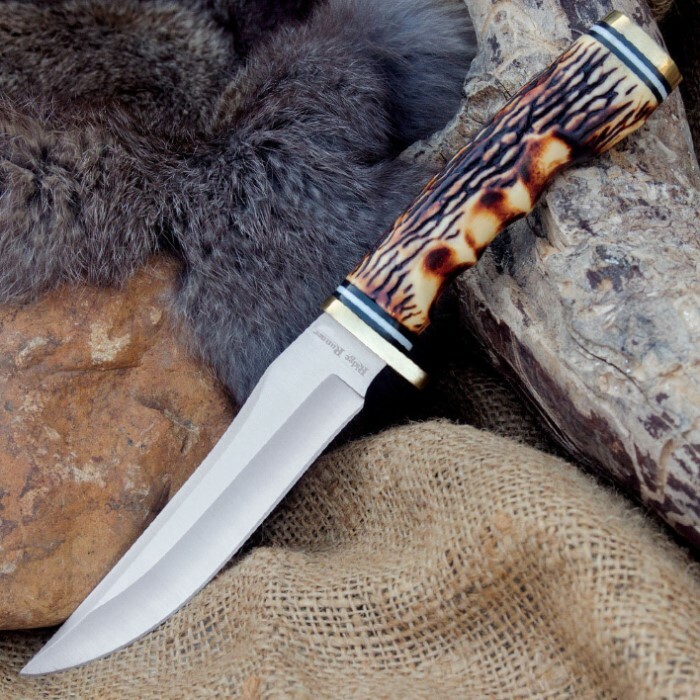 Our Ridge Runner Large Wichita Skinner is the perfect knife to take out with you when you're hunting. There's no question that the jigged bone handle is attractive but the ergonomic grip makes it practical, as well. You can count on the razor sharp 4 7/8" 420 stainless steel blade to take care of any job, large or small. The icing on the cake is the gleaming, mirror polished stainless steel guard, bolsters and pommel. A tough custom nylon sheath is included to house the blade. 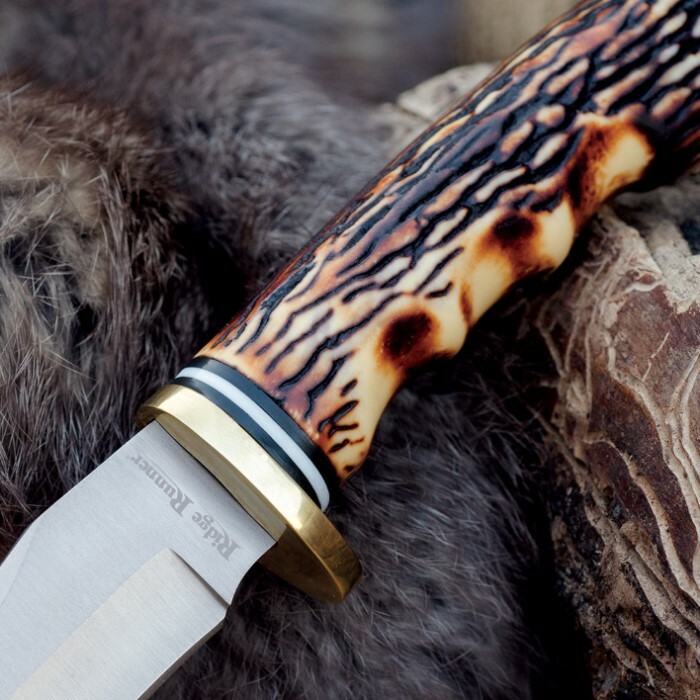 The Wichita Skinner is for the hunting enthusiast who appreciates superb quality craftsmanship but understands it doesn't have to cost a fortune. This is a sweet little knife. I wasn't expecting much, but wow! The blade is very sharp and the handle is more beautiful in than I expected it to be. Ridge Runner never lets me down. Love this knife. Love this company. Thanks BudK! just got the Wichita skinner today almost exact replica of the golden spike fairly sharp out of the box a few strokes thru my electric sharpener with the 6000 grit stropping belt now it crazy sharp good deal for 10 bucks. this is a good knife the blade is nice the handle is cool i like the handle i would uses this knife for hunting. The Wichita Skinner is a decent,small knife. It is also fairly sharp right out of the box and looks good too. It's a good value for the price. Got this for my grandson as his first hunting knife and was very pleased. Had it engraved, looks good and very sharp. Can't beat the price! Just bought mine today very sharp rite out of the box lookin forward to using it once I get one on the ground to skin out.